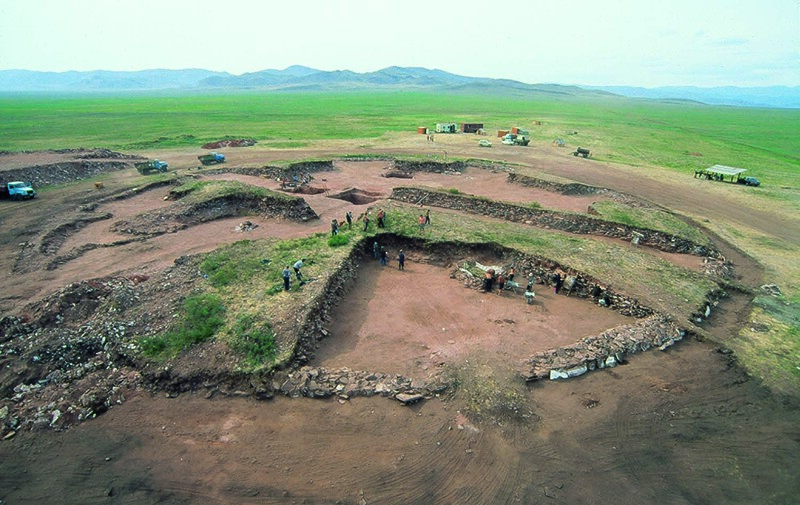 View of 7th-century BC early Scythian burial mound at Arzhan-2 being excavated by a joint State Hermitage Museum/German Archaeological Institute expedition. © Eurasien-Abteilung, DAI. The Scythians buried their dead and marked their tombs with burial mounds. There are tens of thousands of these mounds scattered across the vast steppe region which stretches from northern China through southern Siberia to the northern Black Sea. 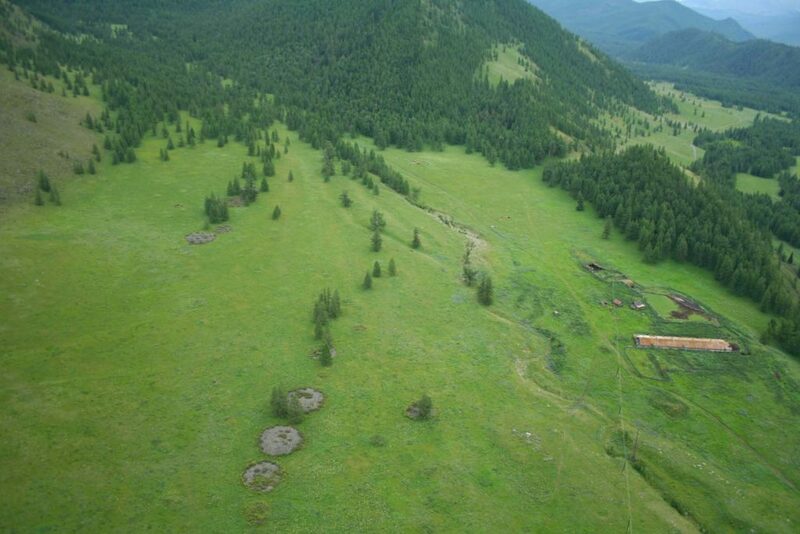 Aerial photo of Scythian burial mounds. © Ghent University, Department of Archaeology, 2007. They are often clustered in groups or lines, and these likely represent tribal or family cemeteries. Some are small, others are very large, and where they are intact the grave goods show that the larger the burial mound, the higher the status of the deceased. Many of the mounds have been archaeologically excavated but most had been looted in the past. The tomb robbers searched for gold or other valuables, but they also desecrated the dead bodies and destroyed tomb memorials. The archaeological excavation of tombs provides us with a great deal of evidence about Scythians of all ages, ranks and genders as the grave goods include everyday items, objects of high value and others which were made especially for burial. The selection and arrangement of these in the tombs show that, like most societies past and present, the Scythians believed in an afterlife. 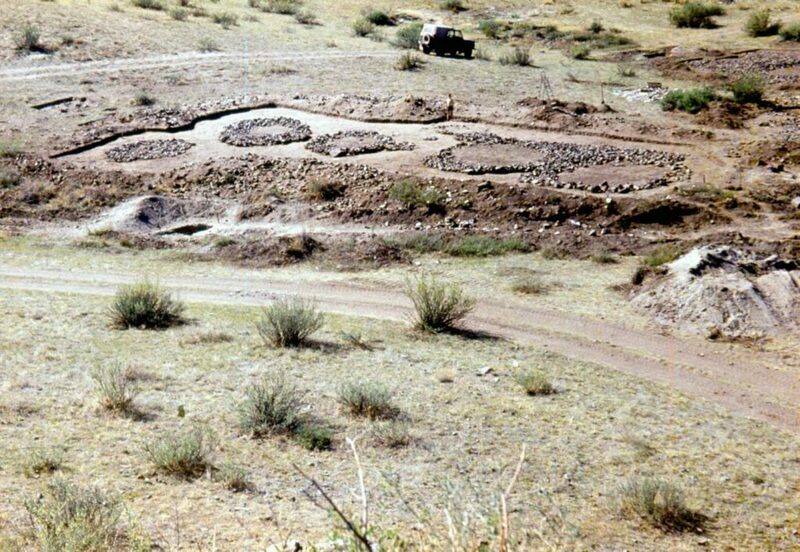 View of Scythian burial mounds under excavation at Bai-Dag II. © K V Chugunov. The Scythians took great care to prepare the dead and practised a form of mummification. The best evidence for this comes from burial mound sites like Pazyryk in the high Altai mountain region of southern Siberia. In this region the winter snow and rain percolated into the tomb chambers below the larger burials. These patches of ground never warmed up enough to defrost in summer, so the contents became preserved in the ice. The tattooed corpses of the Scythians were carefully dissected. Their entrails were removed and replaced with straw before sewing up the cuts with animal tendon. Small holes were also carefully cut in the sides of their skulls and the brain matter was also replaced with dry straw. The men had been shaved and sometimes the fingernails were clipped and buried with the dead person. The bodies were then dressed and placed in hollowed out and dressed log coffins. Some of these coffins were decorated with carved scenes or tin foil covered leather appliques showing rows of birds or striding elks. The deceased were accompanied by a range of personal items, either placed in the coffin or on the floor of the tomb-chamber. At Pazyryk these included personal ornaments, mirrors, low tables, braziers, small vessels made of wood and pottery, knives, and leather bags and pouches. Meaty food offerings were also left for the deceased and the charring of the hemp seeds in the braziers imply these were lit and the aromatic smoke filled the chamber before they finally went out. 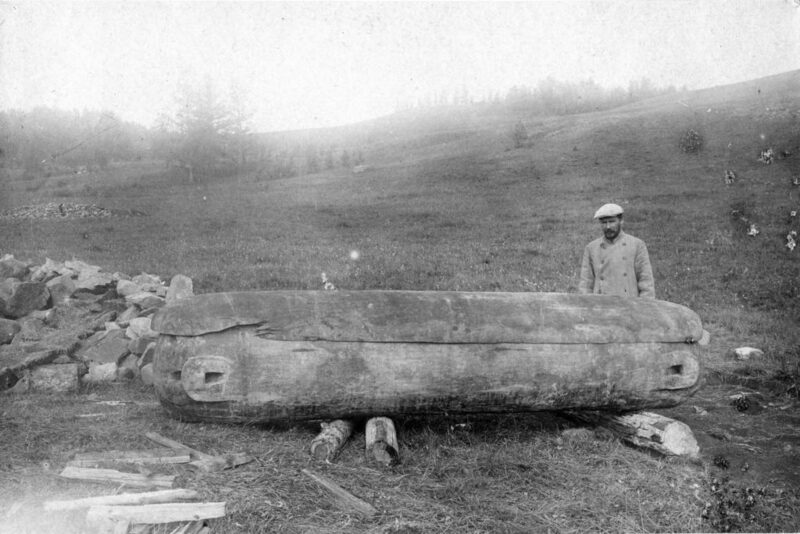 Log coffin from burial mound 1 at Pazyryk, 1929. © Archive of the Institute for the History of Material Culture, St Petersburg, О.3587.18. The tomb-chambers were effectively log cabins. They were built of larch wood logs which were felled nearby, incised with marks and dragged on rollers to the burial place before reassembling. The ends of the logs were notched so that they interlocked and the logs used for the roofs were dressed. The floors were made of planks. The carpentry skills suggest that these people built similar structures for use in winter. Inside the tomb-chambers, felt coverings were added to the floors and nailed to the walls. This was mostly undyed dark felt but some of them had coloured designs and show rows of roaring lions’ heads and other figures. 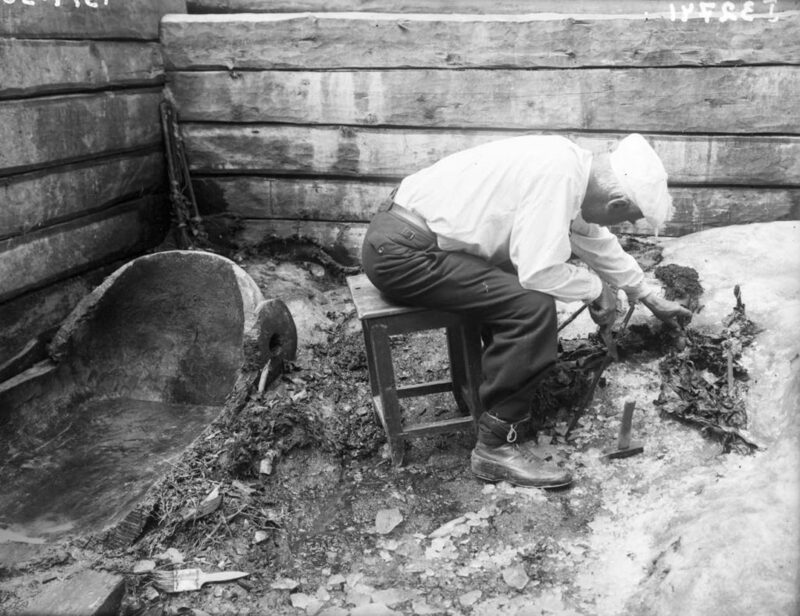 Excavating inside the tomb-chamber in burial mound 2 at Pazyryk with the finds still trapped in the ice, 1948. © Archive of the Institute for the History of Material Culture, St Petersburg, O.1672.54. Tree ring dating of the five large tombs at Pazyryk show that they were constructed over a period of 48 years. Radiocarbon dating proves that they date to the mid-fourth to early third centuries BC. The roofs were covered with layers of leaves of cinquefoil (Dasiphora fruticosa) and sheets of larch and birch bark which were sewn together and lined with moss. The birch bark must have been removed in spring. This is confirmed by the presence of small flowers belonging to white-yellow scabious (Scabiosa ochroleuca L.) as these only flower here in late June and early July. 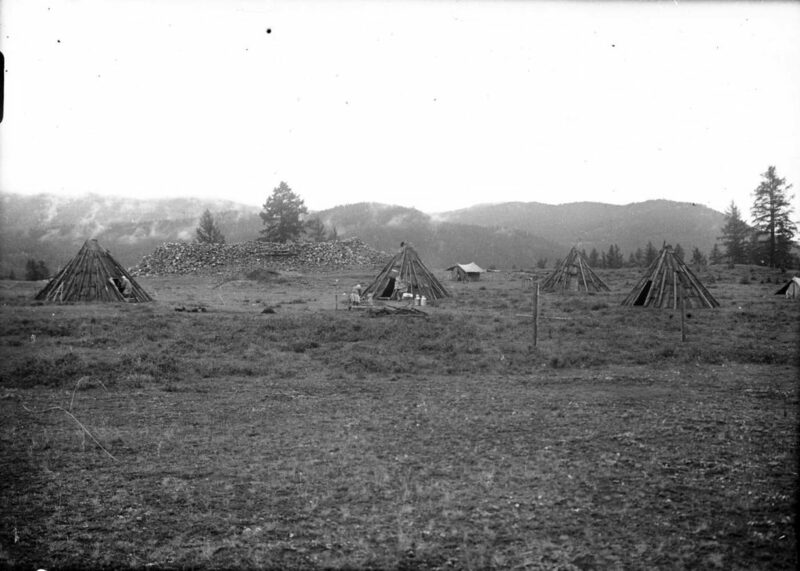 View of burial-mound 5 at Pazyryk with traditional seasonal shelters around, 1949. © Archive of the Institute for the History of Material Culture, St Petersburg, О.1590.6. The use of birch bark as insulation also suggests that the ancient Scythians may have made other temporary shelters of similar materials, still a common practice in this region as late as the mid-20th century. 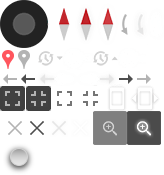 However, birch does not grow in this high mountain region so this material must have been brought here from nearby valleys. The personal saddle-horses of the deceased were killed and buried with their owners. The corpses were lowered with ropes into the grave-pit and placed immediately outside the tomb-chamber. They were accompanied by their horse harness, and their bodies arranged in rows facing east, the direction of the rising sun. Recent horse DNA analyses from different sites show that not all the horses were related – it is quite likely that some were gifts left by different horse-breeding tribes. A unique four-wheel cart with its draught horses was also buried in burial mound 5 at Pazyryk, along with a large felt hanging and an imported pile carpet. The pit was then carefully backfilled with hundreds of logs and stones, and the worn and sometimes broken tools used in digging the ground – wooden wedges, massive mallets, shovels and log ladders – were thrown in. The final stage was building a burial mound of boulders and gravel over the top, and at Pazyryk these are up to 46 metres across. Section through burial mound 5 at Pazyryk. Drawing: Paul Goodhead after S I Rudenko, Frozen Tombs of Siberia. The main burial mounds at Pazyryk belonged to high-status men and women. However, all had been robbed in antiquity, so there were very few intrinsically valuable objects in these tombs. This probably also explains the lack of many weapons, which were typical grave goods at other Scythian sites. Interior of the unrobbed main grave at Arzhan-2. © Eurasien-Abteilung, DAI. 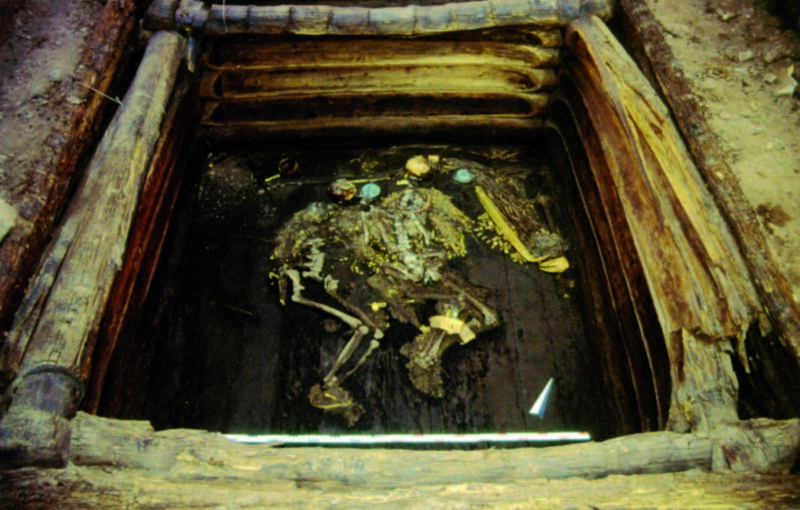 Other sites add more information about Scythian burial practices, such as the large intact burial mound at Arzhan-2 in the Tuva region of southern Siberia. Its recent excavation proves that these burials sometimes contained large amounts of gold personal ornaments, as well as highly decorated weapons, and the types of objects found at the earlier discoveries at Pazyryk. Ultimately, the archaeology of death is fundamental to our understanding of the Scythian way of life. It is from Scythian tombs that we have direct evidence to try and help us work out what these people were like. Read more about some of the objects found in burials in this blog post. St John provides a handy introduction to the Scythians in this blog post.